Write a book. If you’re a small business owner, entrepreneur, copywriter, coach, or freelancer of any kind, it will open up doors for you like nothing else. I’m talking a non-fiction, real, physical book. 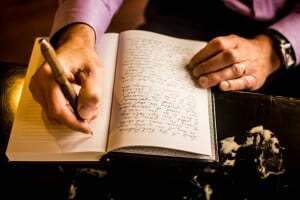 Write a good book – not a glorified blog post, skimpy ebook, or transcript of some podcast or speech you did – and the world will look at you with different eyes. You’ll have a new-found respect from your peers and prospects alike. You have important things to say, and the world needs to hear them. People don’t throw books out. Somewhere, 50 years from now, someone will stumble upon your book, read it, and act on it. When you’re sitting on a plane and the guy next to you asks what you do, you can simply say, “I’m an author.” Much easier than trying to describe what a copywriter is. You’ll get introduced to more people. Everyone wants to tell people about their friend, the writer. If you’re single, you’ll get more dates. If you’re married, you’ll have at least one person who thinks your book is the absolute best. It will give you more credibility in your field. You can autograph a book. Hard to do with an ebook. Print is far from dead. In fact, according to a recent New York Times piece, ebook sales are slipping. Ebooks don’t make good gifts. Print books do. You’ll get you speaking gigs if you want them. Those speaking gigs will lead to more clients. People will start asking for your advice more, on all kinds of topics. This could be good or bad. A book is much more effective than a business card. One book leads to a second book. It’s just the beginning. When you send your book to a good prospect, there’s a good chance it’ll get their attention. If you send it 2-day shipping via your Amazon Prime membership, your only cost will be the price of the book (and you’ll get your cut of that). Instead of always directing people to your website, you can tell them to check out your Author Page on Amazon. A good Amazon Author Page could hook as many people as your website. Amazon is taking over the world. Why not be a part of it? You’ll be able to develop programs and courses based on your book, bringing in more revenue. You can get interviewed on podcasts, lots of people will hear it, and your reach will spread. You’ll get interviewed on radio stations if you want to. Podcast interviews, radio interviews, and speaking gigs will drive traffic to your website. Offer the first two or three chapters free on your website to grow your email list. A bigger email list means more opportunities for selling your other products and services. You’ll be able to raise your fees on everything you offer because of your newly perceived expertise. Remember your sophomore English teacher who gave you a “C”? Send her your book (if she’s still alive). If she’s not? Send it to someone else who doubted your abilities. Market it right and you’ll have a nice, ongoing source of passive income. Plan from the start to write a whole series of books. Think Robert Kiyosaki’s Rich Dad series, or Tim Ferriss’s Four-Hour books. If people buy one, they’ll want each one in the series. Bad at shopping for people like I am? Give them your book (autographed, of course). Autographing your own book has to be one of the coolest feelings. I’ll let you know. I don’t recommend this as a book-selling strategy, but can you imagine doing a book signing at Barnes & Noble? Again, this isn’t a strategy I’d recommend, but small, independent bookstores would be glad to have you do a short presentation and book signing for their members. Helping an independent bookstore promote your signing will give you more practice selling yourself. Promoting yourself will come in handy when you’re famous. You could become a New York Times bestselling author and make a lot of money. Someone you love will look at you in a whole new light. There you go. 41 reasons to write a non-fiction book to help build your business. Which are your three favorites? Any that I missed? Let me know. #29 – I had one high school English teacher I’d love to give my book to (when I write it) to say “Thank you! See what you helped me do?” because he was so good and so encouraging (if I could find him). That’s one to add to the list, Sharon! “Send it to a teacher who helped you and encouraged you.” Why didn’t I think of that? Thank you. I’m long over due for my first book. I’m sure it would be novice, but regardless it has to get done. Haha, since I’ve started this whole “i need a book” thing, I should have had at least 2 books done. sheesh! Hey, you can always do a second edition and improve upon the first, David. Start with something, even if it’s a short ebook. I like number 21 “Amazon is taking over the world. Why not be a part of it?” Selling a book on Amazon I’m sure would drive a considerable amount of traffic back to your own site. That’s the plan, Jose. I really think every freelancer and small business person who has some good ideas should write a book. I Like #5, #8, #20. Get introduced to more people: As an introvert I can see the advantage of something that would help me meet people. A book certainly provides the means to meet people. Give more credibility: Credility, as well as trust, is important to being successful online. A book shows people you know your subject. Amazon Author Page: This shows cedibility and it gives you a sense of importance. And who doesn’t like to feel importand, plus the doors that’ll open to you. There, you go Steve. My three favorite. Thanks for your feedback, Terrence. Do you have anything in the works? Let me know if I can help you in any way. If you want to travel, but you’re low on funds or concerned about running out of money abroad (with not enough freelance assignments to fill your wallet) teaching ESL is a great alternative. Even with the most basic qualifications, when you pull out a book with your name on the cover (which I have done) you will be offered the better assignments. BIG Bonus: you get to meet the ‘real’ people, forming friendships that make the trip so much more meaningful than ‘just’ being a tourist in their country. Wow, Jackie! That’s a great idea I never thought of. My mom was an ESL teacher for over 30 years, so I’m familiar with it. I’m in no way qualified to teach ESL, but who knows? Maybe with some training down the road I’d consider it. Those are all incredible reasons to write a book. I wouldn’t advise anyone to write one until they have an audience. It’s the same with any content. The more subscribers you have the more valuable every piece of content becomes. The more traffic you direct towards your content, the more new traffic you’ll get back. Take Itunes for example, if you released a new podcast and sent 1000 people to the podcast and the all downloaded it. You’ll rank higher and get more traffic in return. However, you only get one chance to be new. So you need to make it count as a book on its own won’t grow an audience. Thanks, Will. “You only get one chance to be new.” Very true. You’re probably right about not writing a book until you have an audience. But you do have to write something and give people something of value in order to attract an audience, right? Kind of a chicken and egg thing, hey?